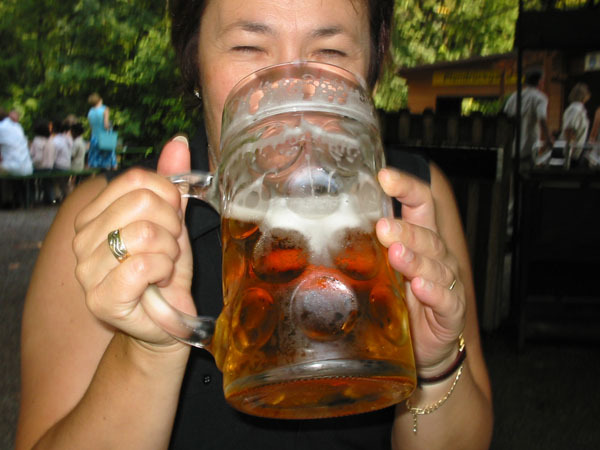 Though it’s healthiest to keep alcohol use to cleaning your Cybex equipment, the lure of lederhosen and accordion music make oversized mugs of beer hard to resist during Oktoberfest, whether you’re celebrating in Germany or at home. But it’s important to remember that they can do a lot of damage. In addition to the calories – most beers contain 100-150 calories per 12-ounce service – a big part of the problem is how our bodies process alcohol. As guest blogger Holly Aglialoro mentioned on the blog in August, alcohol is one of the culprits that cause unhealthy fat distribution around the abdominal region. Beer belly is not a myth! Excess weight in this region has been proven to contribute to heart attacks and heart disease. That’s why it’s important to keep alcohol consumption moderate, along with other foods that lead to unhealthy fat distribution – white bread, potatoes, pasta, white rice, cakes, cookies, donuts, etc. Replace them with whole grains, veggies, lean meats (no, bratwurst is not a lean meat!) and other healthier foods. Of course, you should also fight the beer belly by working out. Online tools such as Workout Routines, Workout Calculators, Training Tips and My Cybex Coach can help you build an effective workout routine to get and stay fit. Finally, even though the beer and bratwursts of Oktoberfest aren’t part of a healthy lifestyle, there’s no reason you can’t still enjoy a nice pair of those lederhosen. Connect with us on Twitter (@Cybex) and share your pictures! The differences in the biomechanics of both the front and back legs during forward lunges.